In mid–December, we did a collaborative column concerning the rapid growth of podcasts with Gerry Purdy, of Mobilicity, a highly respected expert on mobile technology and its growing applications. It got us to thinking about how ultra–personalized OTT (over the top) content distribution has really stimulated personalized and ultra personalized content information, education and enjoyment. According to industry analysts, 36 percent of the world's nearly 8B population has a smartphone and Statista reports that more than 60 percent of the TV viewers use the smartphone to watch/listen to other shows or participate in show social media sites. With the slow introduction of high–speed 5G technology starting this year, it is projected that more people will take advantage of their always–available, always–on smartphones for their information/entertainment. Purdy highlighted the expanding audio podcast market, but we like to think of the potential in broader audio/video terms. The truth is our kids have never sat down in front of the TV without their smartphones in hand and earbuds hanging down. We used to think they were online getting insider information and exchanging discussions about the shows, plots and actors. Our daughter corrected us, saying she was actually listening to a Netflix podcast, so she could binge on the details of the shows she was visually bingeing on with the TV, her Mac or iPhone. Our son was catching up with several of his video gaming streaming segments. All we could think was, "Kids, you really need to get a life!" It turns out our daughter has 10 podcast channels – audio and video – she tunes in to regularly to get her news, information and entertainment; while our son has six video and two audio channels he "tunes in" to. As Purdy pointed out, Apple is the home of over 525,000 active shows with more than 18.5 million episodes in over 100 languages available in 155 countries and 29 groupings of localized editorial. Being Heard – Audio podcasts have gained a strong foothold in the information/entertainment arena as people have their "receiver" with them all the time. Video podcasts are gaining popularity as people begin taking advantage of the speed, capacity and reliability of 4GLTE technology and prepare for 5G availability. In addition, there are hundreds – probably thousands – of audio and video podcast hosting sites around the globe. The great thing is there are a number of sources for finding a podcast you'll enjoy. Enter the name of the person or the topics you want to watch or listen to and BAM! you'll locate the subject of interest in no time. Reaching Mass – With folks accustomed to doing a quick search and quickly finding the audio/video content they want combined with the lower production cost, podcasts/webcasts can efficiently and effectively reach 10–100,000 people around the globe who are interested in specific subjects and content. The trend will continue to grow. Hate to keep going over the same path again and again; but Chris Anderson, of Wired magazine, spelled out how content was going to be personalized back in 2004 when he first came up with the long tale concept. Getting the exact demographics and viewer/listenership of an audio or video podcast (we lump webcasts in the category) is difficult. While only half of the 8B people on the planet are internet connected, we're pretty certain only a portion of them are interested in keeping abreast of the very latest in tech news analysis, content creation technology/workflow issues/solutions or content production/distribution standards/technology. But they have drawn audiences. Between 2014–17, viewer/listenership increased more than 157 percent––undoubtedly due to the fact that more people are getting more of their unfiltered news on their smartphones. For example, we've enjoyed Recode Decode podcasts for years. Where's the Meat? – Kara Swisher, host of Recode Decode, has become a recognized and respected individual in the technology industry. She goes toe–to–toe with corporate and industry leaders to get the straight answers listeners want in today's market. Without a doubt, she's one of the sharpest (and at times toughest) hosts you'll enjoy whether she's on stage and their annual events or biweekly on her interview series. Co–executive producer of the Code Conference and co–host of Recode Decode with Walt Mossberg before he retired, she is able to consistently get some of the most influential business leaders on the show. There are times you wonder how she gets them to commit to be on the show because she conducts a hard–hitting, no–holds–barred set of interviews. They're a lot like the best 60 Minutes interviews you'll watch because she asks the questions people want answered without being mean about it. Okay. it's just a darn good show because the host is a strong journalist! One of our long–time video industry shows has been Larry Jordan's Digital Production Buzz. Buzz has been around since the beginning of podcasting. It's the second–oldest show you can listen to – Adam Curry's All Things Digital went on the air in May 2000 and Buzz "hit the airwaves" in September. 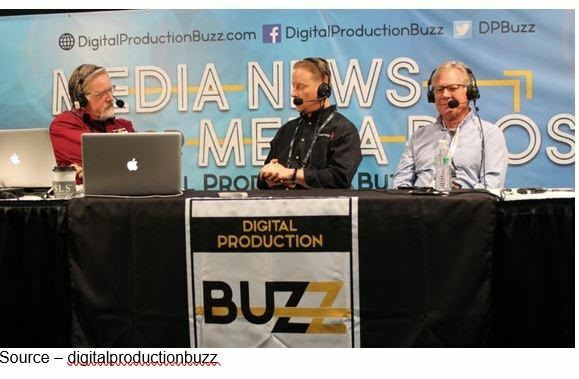 On the Air – Weekly, Larry Jordan (l), host of Digital Production Buzz, interviews some of the most respected people in the content creation industry. His annual show at NAB gives senior management such as Dan May, president of Blackmagic Design, the opportunity to discuss what's new and why it's important to the audience. Also on the show is Michael Horton (r), co-host and president of LAPCUG. The show has been on the air for the past 18 years, usually with four interview segments with executives and technology experts from around the world. What we like most about the show is that in the four separate segments there is almost always one interview exchange we find of interest. For a brief period (2015–16) Buzz was video and according to Jordan, now that video streaming has become more reliable, they will add video to the mix this year. We're sorta' looking forward to seeing Buzz back on the air! The show is aired live every Thursday evening and then recorded/stored on Libsyn for distribution through iTunes, Spotify, Libsyn, IHeartRadio and DigitalProductionBuzz. When it comes to video podcasts, we're the first to admit that we play a little loose with the description because we tend to see webcasts and podcasts in the same light…when we "tune in," the show is there, and we watch it. It's similar to what we do with our streaming TV shows and movies whether they're on Netflix, Amazon Prime, Hulu, HBO, YouTube or your favorite here. Like streaming TV/film services, most are by subscription – free or paid. A show that has become one of our viewing standards is the Digital Cinema Show hosted by Digital Cinema Society President, James Mathers. The program focuses on helping industry professionals keep current on motion picture technology. DCS has more than 7,000 members around the globe who regularly "tune in" to stay current in their work. In addition, they also attract thousands from their postings on Facebook, Twitter, LinkedIn and Vimeo. Pro to Pro – James Mathers (r), president of Digital Cinema Society and host of the Digital Cinema Show, interviews Academy Award–winning Cinematographer, Russell Carpenter, ASC, during their annual DCS Cinema Lighting Expo. Mathers schedules film industry production experts and industry leaders as guests to give the growing audience a better idea of where the film and TV industry is going. The Digital Cinema Society is a nonprofit educational cooperative dedicated to helping the industry keep current on motion picture technology. Now entering their 16th year of operation with an international membership nearing 7K, they also attract many more thousands of followers on Facebook, Twitter, LinkedIn and Vimeo. For nearly 16 years, Mathers has streamed coverage and interviews from NAB and CinGear Expo. The show coverage also includes segments on lighting, post, camera support, accessories, lenses and more. In addition to shows that cover motion picture production and post, they recently held an event on indie film finance and distribution which has also been posted as webcasts for their audience. Staying current with the industry, DCS recently added a streaming link – https://tinyurl.com/yc4vmsqw*** – to keep people abreast of what's happening in the industry. For the video content industry, SMPTE (Society of Motion Picture and Television Engineers) has the most informative video webcast programs you'll find online. With the rapid changes taking place in the industry, Joel Welch, director of education, told us they were in the process of beefing up and broadening their online viewing services. During the year, they have a regular series of Standards Update Webcasts (check the site for listings) on the latest standards developments that give viewers a chance to "peek under the hood" and understand the issues and developments. Opening Title – One of the most popular webcasts SMPTE puts on annually is a member update and open question forum. The webcast is streamed live with plenty of give and take between executives and the audience. For those who can't view live, they can stream it on their device when they have the time. SMPTE members have access to a wide range of Technology Webcasts (non–members can view for a small fee0 covering hot topics and technologies. It's a great service for film/show production professionals to "tune in" to shows that include storage, stereoscopic 3D, live streaming and a rainbow of subjects (click here for entire list of webcasts). If you can't catch the regular 90–minute live SMPTE Standards webcasts, there is always on–demand playback. Simply click here to see what you've missed. Webcasts (public and private) are becoming increasingly important for organizations, especially in the B2B educational/informational arena. The problem is most are talking heads, head/PowerPoint or other weak sales pitches that bore people into a coma. With sufficient bandwidth and economic, easy–to–use creative tools, they represent a tragic waste of opportunities. However, there are those who have found the secret by combining craft – what you expect to learn from the webcast – with creativity. Jason Bache, of NerdsLimited, and his team tailor their presentations to a specific company audience and treat the event as a creative video production. "Sterile voiceover presentations that regurgitate the same words combined with ‘beep, next slide' are too prevalent and too ineffective when the training session doesn't have a strong dose of creative art, so people enjoy learning," he explained. "Yes, we have a list of craft issues we need to cover in the webcast," he explained, "but the order, method, depth and supporting examples need to be creatively incorporated so the webcast not only educates and informs but also entertains and keeps the viewer interested and involved." "Corporate production and training webcasts that lack art simply let the air out of the room, wasting time and money for everyone," he concluded. Central Source – A growing number of apps have been developed to make it fast and easy for people to locate the specific audio and video podcasts they want to listen to or watch when it is convenient for them. The growing use of smartphones has also stimulated increased interest in special interest podcasts. Brands like Pepsi, Starbucks, Google, Microsoft, Dell, HP and hundreds of others have jumped into the audio/video podcast and webcast arenas and have indicated they are seeing strong response and following. As Purdy noted in the joint column, there are over 525,000 active shows, over 18.5 million episodes and increased attention in the benefits and use of video streams. In 2017, it jumped to 13.7B downloads and streams, across Podcasts and iTunes. In March 2018, Apple Podcasts passed 50B downloads and streams. While there are a lot of strong, informative podcasts out there, creative minds and innovative organizations are creating new ones. And given the strip–mining social media firms are doing with everyone's privacy, they create a path for these podcasts and webcasts to reach individuals who want to learn more about specific subjects. Steady Growth – The popularity of special interest audio/video podcasts has grown steadily among both sexes and all age groups. With more than half of the world's population now online, the breadth of audio and video shows capturing audience attention continues to grow. You will have to promote the content on a consistent and continuing basis. It has taken years for Digital Production Buzz to become the podcast to tune in to to find out the latest in the content production industry. It has taken an aggressive outreach program (plus meaty content) for Recode Decode to become the pulse of the technology industry. It has taken work for Digital Cinema Show and SMPTE Webcasts to be considered reliable industry sources. It requires reliable information and an ongoing focus on consistent promotion to grow your audience. They're perfect for on–demand, content binge consumption, which users have become accustomed to from other media. They're ideal for customized/personal curation. Listen/watch what you want, when you want. Audio/video podcasts and webcasts will assume their rightful place in the viewing and listening spectrum for creative content folks to bypass traditional restraints and reach an interested audience. Mildred Hayes realized that when she said, "Wow. When you can't trust the lawyers and the advertising men, what the hell's America coming to, huh?"